The Amish Bonnet Top Curio Cabinet brings an elegant design to your dining room, living room or foyer. 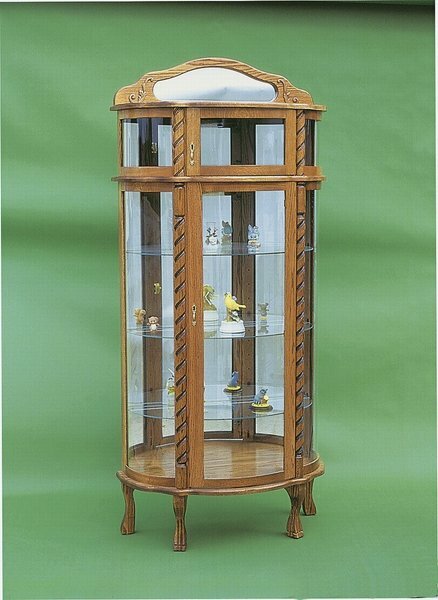 This Amish made curio cabinet is a keepsake itself, displaying the quality craftsmanship that you are looking for. With rope twists carved and sculpted to perfection and a curved glass door adding a decorative flair, this solid wood curio cabinet will become a family favorite. With three adjustable glass shelves providing space, this china cabinet brings room for either dishes or treasured items that you'd like to display. The mini-cabinet at the top of this curio case is a special place to showcase something special. A small door opens to this top case. With adjustable glass shelves, a mirror back to add depth and touch lighting to illuminate the contents, this curio cabinet lights up the room. Customize this curio case with additional shelves in wood or glass. Review our blog post, "Curio Cabinet of Curiosities," to learn more about the lovely curio. Consider our Amish Hutches for additional display and storage. The Bonnet Top Curio is the cabinet grandchildren will stand before wide-eyed. Share the stories of your precious items with family, displayed in an heirloom-quality cabinet that will stay in your family for generations.